So you are on a low salt diet – BLAH! Not true! There are many ways to get around no salt added. Sure salt tastes great and can enhance the flavors of food. Who doesn’t love a salty chip or french fry….but then again, those are not the healthiest choices for anyone. Nowadays there are a lot of low salt/low sodium products available. A little sea salt can add a lot of saltiness in dishes. Substitutions and fresh ingredients can go a long way in adding flavor too. Use fresh sage on chicken, basil and fresh tomatoes or cilantro tossed with shrimp. Fresh herbs infuse flavor in many dishes – toss in a sprig of rosemary while cooking a beef stew or oregano and thyme in that pot of chicken soup. You won’t even miss the salt. I know what you are thinking – fresh herbs are expensive. Why not plant a little patio planter full of herbs for a summer full of good eating, one sprig at a time? Or use dried herbs that are less than a year old add the best flavor. Using a low sodium chicken or beef broth or start with water and add lot’s of veggies – onion, carrots, celery, parsnips, fennel and tomatoes for homemade flavor and no fat or salt. Use whole grain pastas, or try quinoa, bulgur, barley, or any grain to round out a brothy soup. Tomatoes and lima beans can be high in potassium – exchange edamame and a touch of tomato paste (low salt of course) for the flavor. A smoked turkey leg cooked in soup adds a great ham flavor without the added salt. Use fruit in your salads for a punch of sweet tart flavor – careful of apricots, melons and oranges which are high in potassium. Use mandarin oranges instead. Try new vinegars (sherry, rice wine, white balsamic) and citrus juices mixed with olive oil or canola oil for a lighter flavorful dressing. My basic guideline is 3 parts oil, 1 part citrus of vinegar, a spoon of Dijon (to taste) and shake! For salads with fruit I like to add a little honey to thicken and sweeten the dressing. Toasted nuts (unsalted of course) add a richness and depth to salads, and it only takes a few for flavor. Sweet potatoes have more taste than a white potato – bake in wedges for a punch of vitamin C and beta carotene! Avoid spice mixes in a package – often loaded with salt. Penzy’s and Whole Foods have options that are salt free and delicious! Add dried fruit to dishes for a nice change of pace and a boost of fiber -dried cranberries are wonderful in salads, chicken salad and oatmeal. Prunes pair nicely with pork, figs with chicken. Make your own cookies and muffins – the house will smell great and you control what goes into the mix. Buy unsalted butter for baking to avoid added salt. Invest in a good low salt cookbook – there are many options out there. Or go online to, http://www.lowsodiumcooking.com, http://www.americanheartassociation.com or other recipe sites for low salt ideas. I love http://www.epicurious.com myself – use the advance recipe search to limit your search to fit your needs. If all else fails, enlist the help of a personal chef to come cook for you. They will have the experience and knowledge to help you enjoy delicious, low salt healthy meals in the privacy of your your own home. I did not fall off the turnip truck last week – we were in Philadelphia visiting my mom and jail. Seriously – the Eastern State Penitentiary – very interesting museum. But I want to share that in doing so, we did not get our beloved produce. This week, we were treated to wax beans, beets, carrots, basil, spring onions, potatoes, mini cucumbers (look like gherkins to be) small leafed kale, and several zucchini and yellow squash. Meal Two – potato salad with peas, yogurt, buttermilk and herbs. I did not have parsley, but opted to use the top of the carrots as a green splash. They actually have a little carrot flavor, and I now know I need to revisit this to use elsewhere. Grilled chicken and sliced tomatoes round out this hot evening dinner on the patio. Meal Three The delicate little carrots were cooked, then sprinkled with fennel thyme salt (Didi Davis) and served next to leftover chicken from last night and corn on the cob. How seet and tender theys were and delicious with the thyme salt. Meal four This morning started the beets that will go into Ina Garten’s summer borscht, made with sour cream, yogurt, dill and chicken stock – perfect for the heat that’s coming our way. I picked up our fish (cod today) we get from Cape Ann fish shares and baked the fish with lemon juice, pink salt and a little comet tail pepper, which gave the fish a nice coriander peppery sweetness. 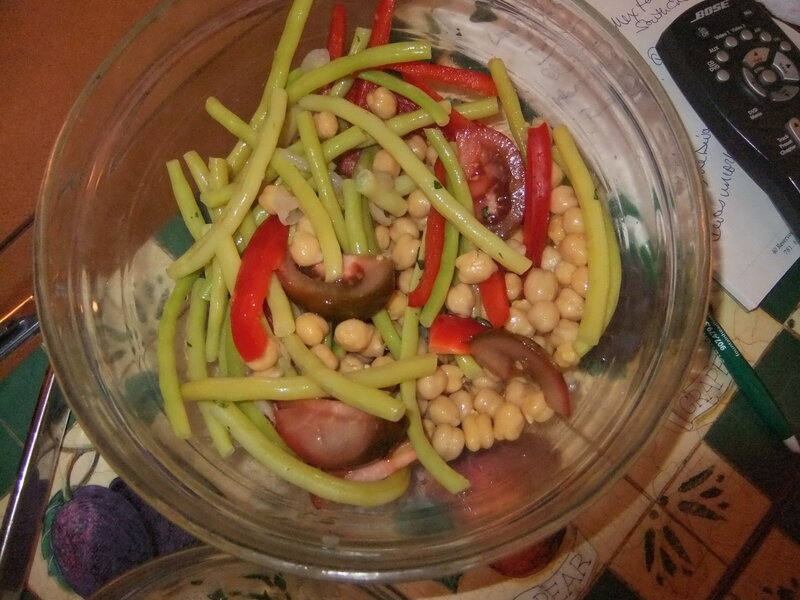 I improvised a salad I saw in Food and Wine to use the wax beans, mixing them with tomatoes, chick peas and sliced red pepper tossed with a fresh tarragon mint vinaigrette made with lemon juice, shallot, dijon, mild olive oil and champagne vinegar. Heavenly! A side of lemon thyme biscuits fit perfectly. Last meal, grilled zucchini with grated cheese may be in order, next to grilled chicken sausage and poblanos. And perhaps another biscuit! Stay cool, enjoy a salad and grilled veggies to help beat the heat, and be sure to drink plenty of fluids….the adult root beer float in this month’s Food Network magazine is perfect for dessert…..
As we age, our bones become weaker due to a loss of minerals, causing what we all know as osteoporosis. Women are more prone than men to have weak bones, especially over the age of 50. Exercise (weight bearing) and diet can help prevent bone loss as can supplements. Adults over the age of 50 need 1200 mgs of calcium a day for good health. Don’t overdo it though – more than 2500 mgs can be harmful. We all know dairy can be a great source of calcium – milk, yogurt and cheese. But there are a lot of nondairy foods that offer a great punch of calcium too – especially important if you are lactose-intolerant. Salmon, tofu, rhubarb, sardines, dark greens, okra, beans, broccoli, peas, Brussel sprouts sesame seeds, bok choy and almonds are all great nondairy sources of calcium. There are also a lot of calcium fortified foods available, like orange juice, cereals, and breads. Read your labels to see if your favorite brand is fortified. Vitamin D and C are very important in absorbing calcium, Vitamin D-rich foods include egg yolks, saltwater fish, liver, and fortified milk. Vitamin C helps the body absorb calcium and is available in many forms including citrus, tomatoes and berries. On the flip side, caffeine can inhibit your body’s ability to absorb calcium and should be avoided for at least 30 mins after taking calcium for maximum absorption. Having said this – a perfect bone healthy breakfast includes vitamin D fortified milk over a healthy fortified cereal, strawberries and almonds with a glass of orange juice. Try a cheese omelette made with whole eggs and spinach with a side of vitamin D fortified toast and almond butter. Yogurt over whole grain waffles with berries and almonds instead of syrup is delicious too. For lunch, try anchovies or sardines in a white bean salad with low fat pudding. Salmon burgers made with red peppers, scallions and topped with a yogurt dill sauce is divine. Grilled cheese sandwiches and tomato soup is a classic, healthy combo. For dinner try spinach lasagna or a tofu stir fry with broccoli, peas, carrots and sesame seeds. Strawberry rhubarb pie a la mode for dessert, or try vanilla yogurt layered with fresh fruit and toasted almonds for creamy goodness. Yogurt or soft tofu can work blended into your salad dressings, and as a topper for baked potatoes. Soft tofu can replace ricotta in stuffed shells, baked pasta dishes and even cheesecake. Experiment with different cheeses for more flavor and variety. Muenster, swiss, gruyere all melt nicely. Try gorgonzola with pears, or manchego or goat cheese in a salad. Use 2% or evaporated skim milk in your favorite cream soup and sauce recipes to cut the fat but not the flavor. Whether you are lactose intolerant or live on a dairy farm, calcium comes in many forms and flavors. Adding vitamin D and C for maximum punch and a few weights for strong bones helps ensure you will enjoy a healthier retirement. Bon Appetit! Folate, also known as Vitamin B9, is an essential part of our diets, aiding in the prevention of anemia, promoting cell production in the skin and helping prevent dementias such as Alzheimers. Choosing foods with higher concentrations of folate (see below) can help you get the recommended 400 micrograms you need to stay healthy. Collards, mustard greens, kale, spinach, Brussel sprouts, asparagus and broccoli all have great stores of folate and can be added to soups, stews, pastas, or eaten as is. Replace lettuce with baby spinach. Add greens to soup, pasta or stews – think Italian Wedding soup. Roasting Brussel sprouts makes them sweet, especially when finished with a drizzle of honey. Saute greens with olive oil, walnuts and yellow raisins, then drizzle with balsamic vinegar to finish. Hate bitter greens? Drop in boiling water for a minute or two, drain, then saute to cut the bitterness. 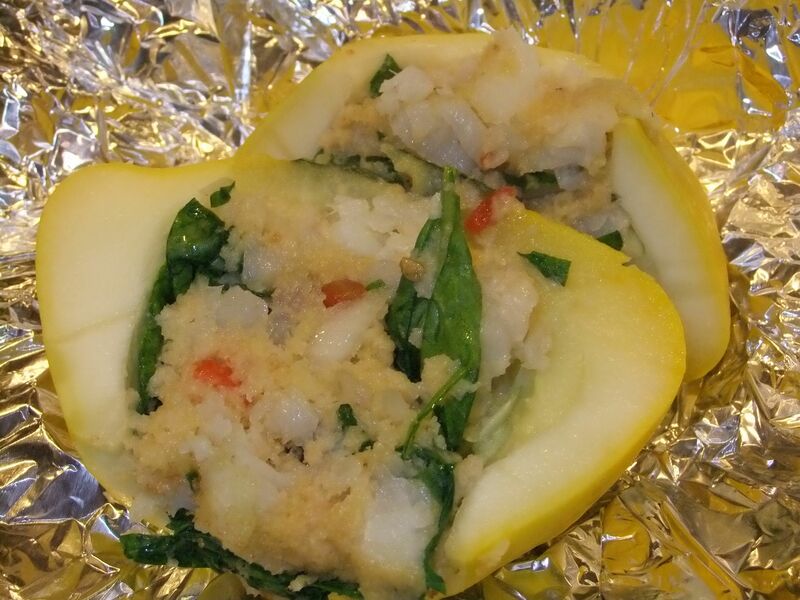 Adding chopped greens to stuffed shells or lasagna ups the nutritional value and tastes great! Who doesn’t like lasagna? Use the same filling to stuff chicken breasts or pizza dough. Broccoli and asparagus can be eaten as a salad (mayo, curry powder and raisins is a favorite of mine), sauteed, steamed, and grilled. Pinto beans, edamame, black eyed peas, black beans, and lentils are economical, full of fiber and protein. Used them as a main meal option. Red lentils sweeten a dish in place of carrots. Using different beans in hummus adds variety when used on a wrap, served as a dip with veggies, or spread on a sliced baguette, topped with roasted onions, artichokes or anything your heart desires. White beans pair nicely with rosemary – which by the way, herbs offer an extra punch of folate! Black beans pair with cilantro, cumin and a hint of espresso. Bake red beans with green pepper, celery, tomato, and a little chorizo for a twist. Saute black eyed peas with dark greens and bacon or smoked turkey. Mix beans into a pasta dishes, salads, or stew, such as Cassoulet. Top any dish with an avocado and fruit salsa (mango, citrus or even papaya), adding a little olive oil, red onion and cilantro – delicious on fish and chicken! Bake fish in foil with orange slices and fresh basil. Replace vinegar with orange juice for a citrusy dressing. Nuts and sunflower seeds add crunch and earthiness to any dish – as long as you are not allergic! Peanut butter in asian dipping sauces enhance chicken, shrimp or steak. Tahini in dressings or drizzled on roasted vegetables is wonderful. Almond based cakes or cookies are easy and delicious. Chop nuts to coat chicken strips or fish cakes (salmon and pistachios match nicely). Sprinkle wheat germ over your morning cereal or yogurt for added nutrition. See it really can be easy to eat well. 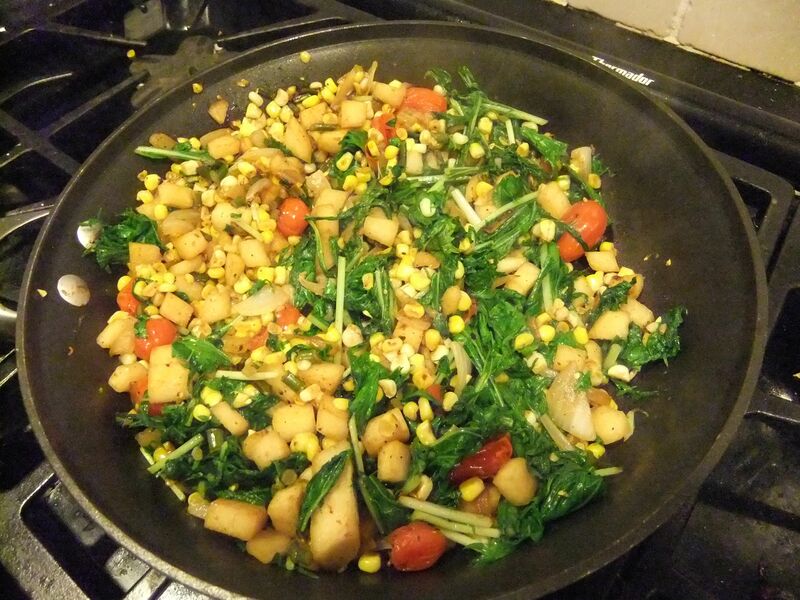 Try searching the internet for folate dense recipes and cook healthier meals everyday. Bon Appetit! Wow, the season is flying and we keep seeing amazing produce fresh from the farm. This week the farm gave us mezuna, shell peas, garlic scapes, green beans, strawberries, arugula, radishes and zucchini/summer squash. As there weren’t many strawberries, those will stay in my cereal bowl. The green beans will be sauteed and enjoyed next to the fish I will pick up tonight (the other half of farm fresh in our house). Garlic scapes. Ummm…..yeah. Long strands of green with a little flower looking end to it. I needed to look this one up. I found out this is the top of the garlic (grows from the bulb) and is actually edible. Using it to impart a milder garlic flavor to dishes, I found out the most common use was in a pesto. I only had 4 strands, and couldn’t make enough pesto to coat a piece of toast, so I decided to chop them up and use as I would garlic. The mezuna is a green that can be eaten as a salad or tossed into dishes much like spinach, kale or swiss chard. 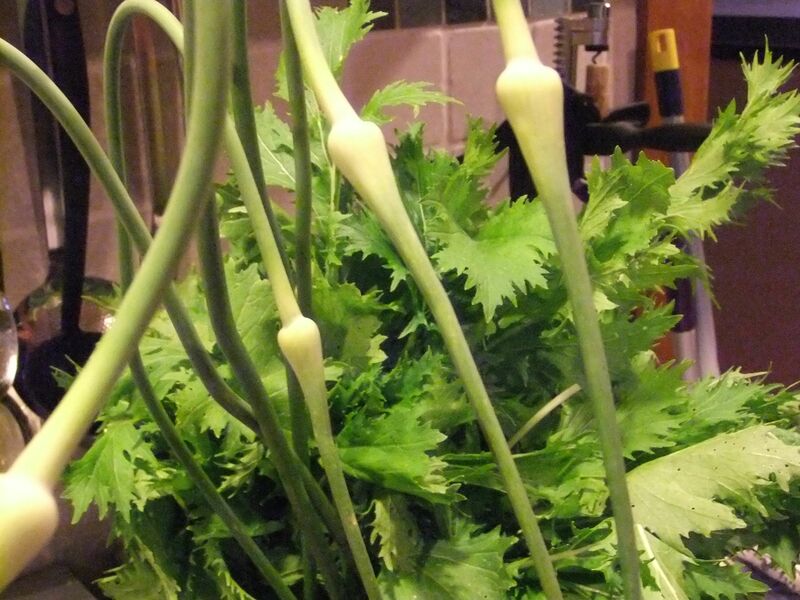 It wilts quickly, is mild in flavor and has a very delicate leaf to it. Using some leftovers, I decide to do a sautee of the scapes, 1/2 chopped white onion, 2 ears of corn off the cob, 1/2 jicama chopped, and 1 cup halved cherry tomatoes in a little butter. Add a little salt and pepper, fresh basil and then the mezuna at the end – delicious and colorful. 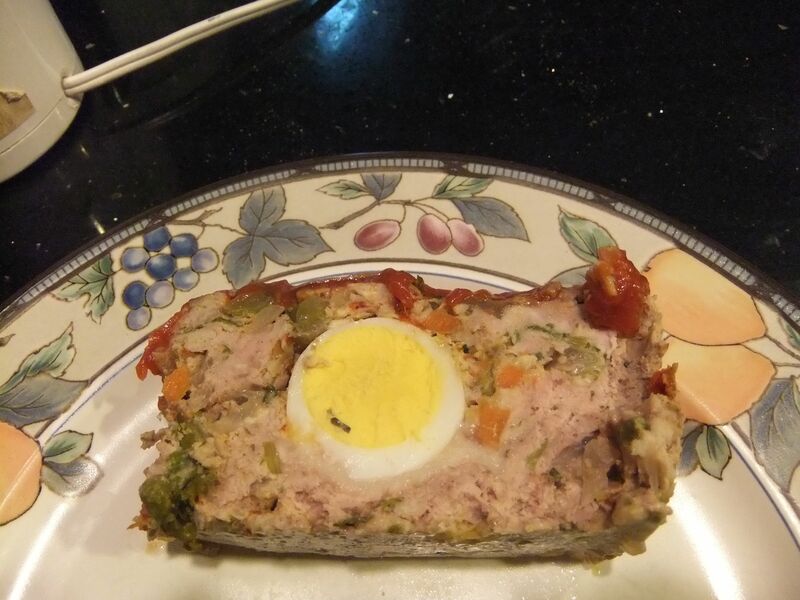 A perfect side dish to the egg stuffed meatloaf I made the night before. Next – the peas were shelled, and pasta cooked. A little vegetable broth, lemon juice and zest, fresh basil (I wanted to do mint, but not a favorite of my husbands) and shallot were sauteed. We had some smoked salmon from Alaska we had been saving (it was canned, don’t get grossed out) so I decided to add that in to the pasta mix with the peas. 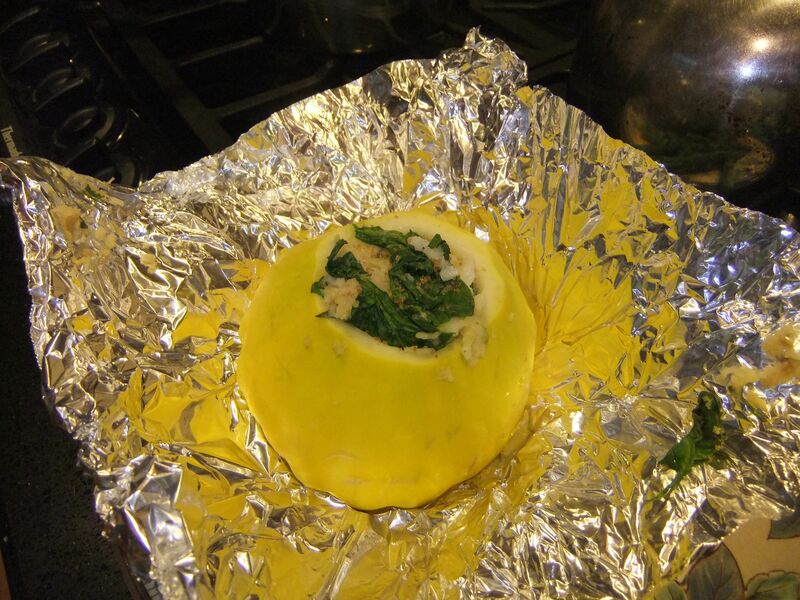 Top with a little grated Asiago – yum! On the side, I had an arugula salad with orange sections, pecans and an almond oil vinaigrette and two very happy people for dinner. The lemon countered nicely with the smoked salmon, and the peas were nice bright green and delicious. As for the zucchini – still debating whether to do a pancake, sautee it , roast, grill, or cut it into long strands like pasta, eaten raw. The radishes I love anyway, but was told by a fellow CSA’er that they are good roasted. I may have to try that one. I know the French sautee radishes in butter, so why not. In the meantime – get to your local farm stand, create your own delicious-ness, and please share your recipes and ideas, or any questions with me at Home Plate Advantage….I love to hear what others are doing out there. Bon Appetit!